Wolfgang Iser speaking on narrative says, "... the reader receives it by composing it." This mirrors Peter Schenck's thesis in "Tell Me A Story" in which he avers that it is by telling a story that we remember things at all. Thus composition occurs in both the sending and receiving ends of a story. Italo Calvino has Kubla Khan ask Marco Polo to tell him about Venice. Polo replies, "Every time I describe a city I am saying something about Venice." Polo recognized that his home city was implicit in every other city he described. From George Miller's famous 7±2 paper, Bruner deduces, "...it means that perception is to some unspecifiable degree an instrument of the world as we have structured it by our expectancies." My equation to describe this process generically is : Pn= f(In, g(Ip)), where Pn is perception now, In is Inputs(raw sensory data) now, Ip is Inputs past, and f() and g() are functions. Thus one may read my equation as follows: our perception in the now is a function (f) of our inputs in the now and another function (g) of all of our inputs in the past (up until now). This equation explains why my favorite phrase "up until now" works so well when placed at the end of a statement expressing a limitation. The phrase refers only to the g(Ip) portion of the equation and reminds us that we can rethink the In in the present moment and open up possibilities that never existed before thereby. Nelson Goodman says, "What must be added is that [all] these versions are true." in referring the multiplicity of explanations for the sun and earth's relative motion. This reflects my rule that "All Meanings Are True(AMAT)." Bruner says, "...actions (anticipated, in progress, and recalled) infuse our representations of the world." Since In refers to "in progress" actions and g(Ip) refers both to anticipated actions and to recalled actions, my equation echoes Bruner's insight here. Carol Feldman says, "Modals expressing a stance of uncertainty or doubt in teacher talk to teachers far outnumbered their occurrence in teacher talk to students." Thus do teachers teach a certainty to their students that they don't believe exists when they talk to their peers. Bruner says of Vygotsky, "...conceptual learning was a collaborative enterprise involving an adult who enters into dialogue with the child in a fashion that provides the child with hints and props that allow him to begin a new climb, guiding the child in next steps before the child is capable of appreciating their significance on his own. It is the 'loan of consciousness' that gets the child through the zone of proximal development." 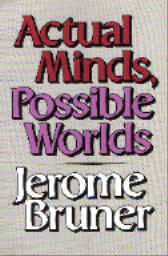 But Bruner also warns that Vygotsky's zone of proximal development is not always a blessing, "May it not be the source of human vulnerability to persuasion, vulnerability because the learner begins without a proper basis for criticizing what is being 'fed' to him by ones whose consciousness initially exceeds his own?" Bruner again, "Literature subjunctivizes, makes strange, renders the obvious less so, the unknowable less so as well, matters of value more open to reason and intuition." In the last sentence of the book Bruner says, "And we should never underrate the boredom induced by empty ideas pretentiously paraded." No better description of 'kitsch' has ever been made, as it includes all manner of literature and art.